Johnsonite Tub Moulding creates the perfect cove finish for bathtubs, counters, and shelves. Made of high quality vinyl. I was wondering what the best product I should order for around my countertop which butts up against tile backsplash? Do I need some sort of adhesive to apply the Johnsonite Vinyl Tub Moulding? I am planning to apply it to the base of a shower wall. I have read that the caulking does not adhere to tub wall. Why is your product different. Can I put this over caulk or do I remove all old caulk. Do you offer with this style or any other, inside radius corner pieces, i need 2 in white. They are not Square they are more of a radius. Can this product be applied around a 90 degree outside corner? Thank you. Johnsonite® Tub Moulding creates the perfect cove finish for bathtubs, counters, and shelves. Made of high quality vinyl. It is difficult to consistently make a neat job where tub meets floor with caulk alone when using the increasingly popular vinyl plank flooring. The low profile makes a crisp professional finish. Thank you for the review and the kind words concerning this product. It certainly is quite flattering coming from such a veteran contractor like yourself. 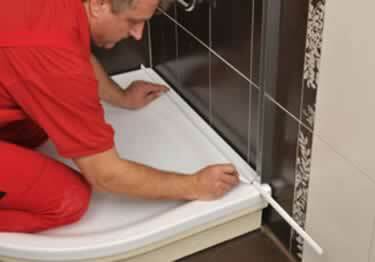 When applying, tiles were scrubbed and cleaned with 3M adhesive cleaner which even removes silicon. Adhesive on this molding still would not hold; ended up using automotive double sided molding tape and it worked just fine.quite satisfied with the finished look. Bathtub was a wreck, cleaned it up and installed this molding now it looks brand new . Wife and kids were amazed at how nice it looks now. Thank you so much !